Most of the time in life, it is best to take a step back and look at the bigger picture to put things in perspective and make a smart decision. But, I have noticed that when it comes to real estate investing, it is wiser to dive in and analyze the specifics of the market to make a solid business decision. 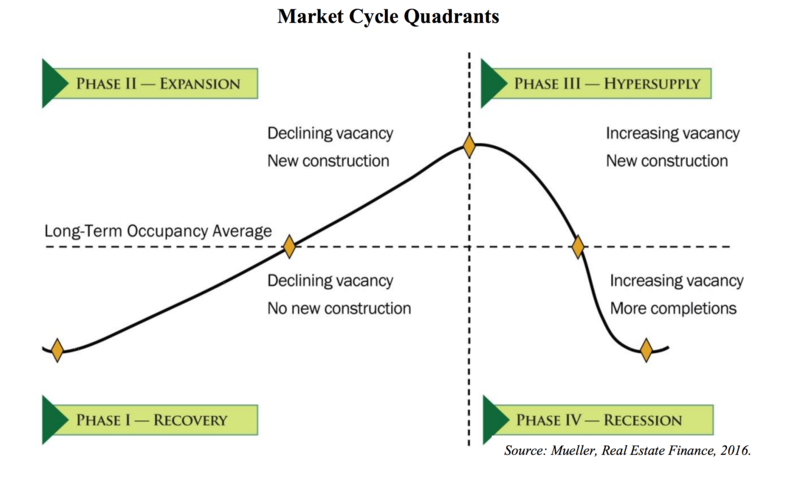 In order to profit on a deal in any market you need to understand the real estate cycle. If you gather information from one real estate market and apply it to another you are at risk of missing out on deals that can generate a good amount of cash flow or long-term appreciation, because markets differ from location to location. Different real estate markets can be in different parts of the real estate cycle simultaneously. It can be sunny in Miami while snowing in New York at the same time. And to get more specific there can be a market within a market that is responding differently. For example, it can be sunny in Coral Gables, FL and raining in South Miami, FL. Closely following your real estate market, and being able to identify the phase it is currently in, is crucial in making a sound investment versus deciding what deals to pass on. Recovery is, most of the time, the hardest phase to signal out. Demand can still be slow when the market is recovering from a recession. Rental activity can be flat and not many developers are building as often, so the market can still seem sluggish. Although, to the trained eye (those paying attention to the details in the data), increase in property showings, a slower pace of past decline, or an interruption in the downward trend are all signals that the real estate market is heading upward in the growth direction. During this recovery period, properties that need renovation and repairing can be a great opportunity to purchase, repair and renovate, then sell it for a strong return in the upcoming expansion phase. This is a great moment to acquire solid assets and hold them until the expansion. Markets in expansion are heading upward and are facing a growing demand. The economy outlook is strong and jobs are plentiful. Rents are rising and vacancy is low. Developers are building more and at the peak of the expansion phase, supply and demand are in harmony. During this stage, builders and investors can profit from a higher demand knowing that turnover has reduced and rents are rising. This is also a great time to execute the strategy of purchasing neglected properties at discounted prices and improving them to make a considerable profit during the expansion phase. Hyper supply happens when the economy begins to slow down or developments continue while demand slows down. Both of these are causes for occupancy rates to decrease and rents to decline. During this phase, wise investors look for good properties with steady tenants and long-term lease agreements already secured. Although, nobody can say when the next expansion phase will take place, these fixed-income investments provide a high level of performance until the next lease assuring stable times when the recession hits. At the same time, investors who can maintain their patience can reap the rewards of the opportunities presented by desperate sellers. When the players in a market can’t distinguish the downturn or choose not to acknowledge the warning signs of slowing demand, the hyper supply phase transitions into the recession phase. You can spot a recession by its oversupply, high vacancy rates and falling rents. In this very saturated market, investors willing to take a higher risk can purchase foreclosure properties, vacant land and fixer-uppers and developments at discounted prices compared to replacement cost. This is a long-term strategy for the investor who is patient enough and willing to work to stabilize the asset and hold until the cycle moves back through the recovery phase. Investors must choose wisely or risk getting burned by the fire. One of the most important factors to keep in mind is that different markets can be in different phases at the same time. So a plan of attack that works in the hyper supply phase in Miami, FL may not be as effective in an expansion phase in Los Angeles, CA. Also, nobody can predict how long each phase will go one for. Even if we look into past data, we can’t expect the same highs and lows because the economy is always changing. On top of that, since cycles can vary from location to location and property type, the key is to be sharp and on the look out while understanding the details of each market so you can wisely implement the best strategy in every different situation. If you do, then you are bound to build a diversified real estate investment portfolio strong enough that has the ability to weather any storm.